The Pueblo Colonial complex, named for its distinctive architectural design, draws inspiration from the early Spanish Colonial influences in Central America. In particular, Pueblo Colonial echoes design themes found in Granada, Nicaragua, the oldest colonial city in the Americas. 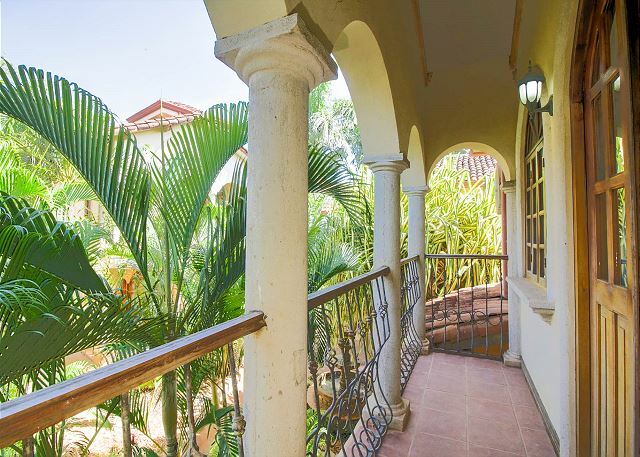 Among these unique colonial features are imported ceramic tiles, handcrafted woodwork, arched doorways and windows, and beautiful balconies that overlook the tropical garden. 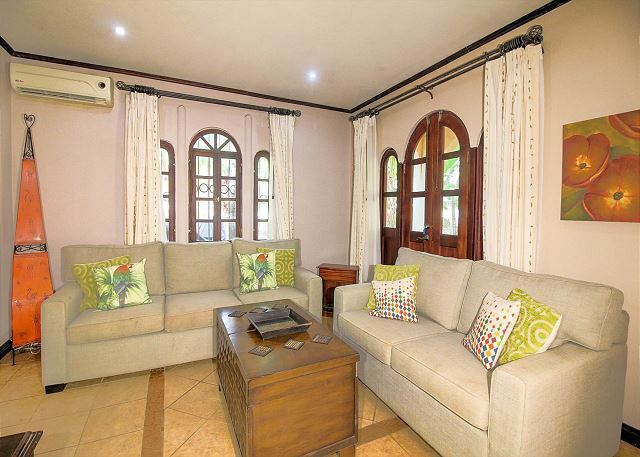 Pueblo Colonial #4, in its tropical elegance, invites you to relax and forget about the world beyond the windows. Cheerful paintings of larger-than-life flowers grace every room, artfully adding color and a sense of serenity. 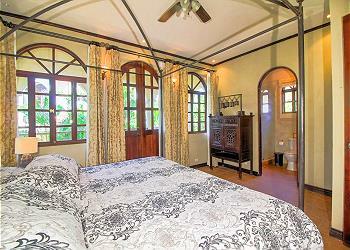 The villa’s furnishings combine the simplicity of classic iron wrought pieces and with the beauty of tropical hardwoods. 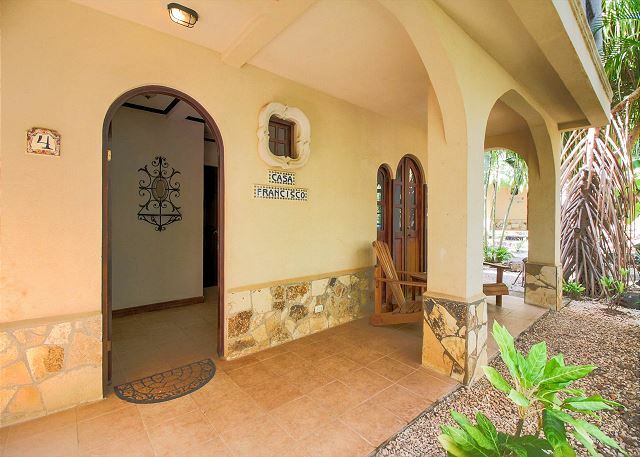 Great care has been taken to prepare all the comforts of home in this villa, including Wi-Fi, air conditioning, linens, towels, and a fully equipped kitchen. 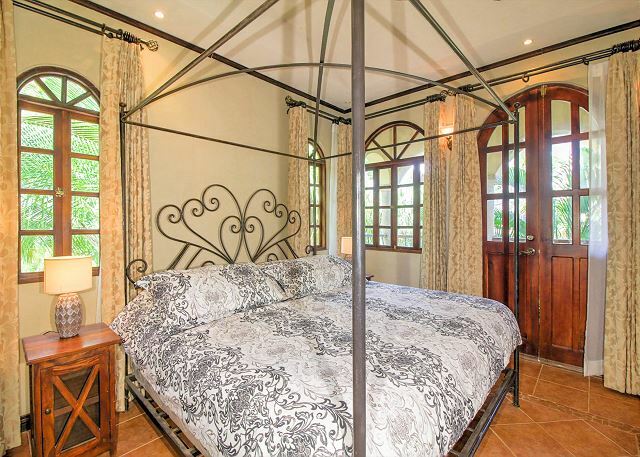 The master bedroom is furnished with a king sized bed, and features a private balcony from which to enjoy the garden breezes. The second bedroom is equipped with a full sized bed and a set of twin bunkbeds, which add accommodation for up to four additional guests. Each bedroom includes its own bath. 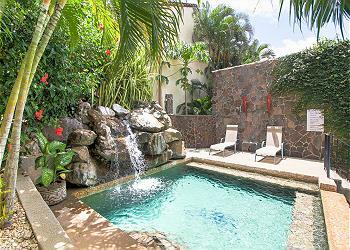 At the center of this gated community, a private swimming pool is surrounded by the lush tranquility of the tropical gardens that give Pueblo Colonial a sense of begin lost in time. 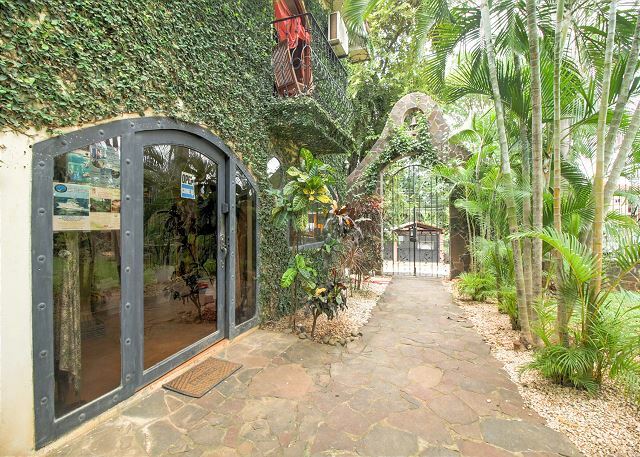 Another amenity of this hidden paradise is its ideal location. 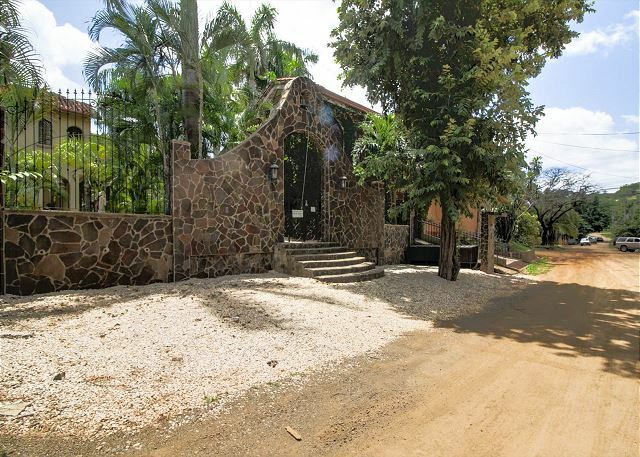 The vivacious center of Tamarindo is within easy walking distance of Pueblo Colonial, placing this peaceful retreat not far from restaurants and shopping, tours and activities, and of course the surf and sand. The Pueblo Colonial complex is the perfect choice for special groups such as family reunions, wedding parties, retreats, corporate incentives, or any other group events that require an exclusive communal space. Each of the 8 independent villas includes a fully-equipped kitchen, a laundry facility, and a parking spot. We loved our stay at Pueblo Colonial. Just a short walk down a dusty road led us into the heart of town and the beach. It was very nice having a full kitchen and especially a washer and dryer!! Pool was lovely and accommadations were fabulous. Highly recommend these villas! Hi Leanne! I am so glad you enjoyed your stay here at Pueblo Colonial and for your recommendation! We do have a fantastic pool, and Warner keeps it pristine for our guests. I hope you will come see us again! Pueblo Colonial is a perfect location to stay. We had multiple family members visiting Tamarindo for a wedding and staying here was a great choice. We had an issue with the shower but it was quickly addressed. The property manager was attentive and friendly. The pool area was gorgeous. 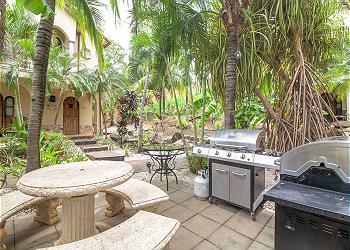 The location is walking distance to town and beach. It was a pleasure to have your family here and I am glad you all enjoyed it. I appreciate that you let me know about that shower so I could get it taken care of right away! I hope you will stay with us again! Pueblo Colonial is a very comfortable compound with eight individual two storey homes. Although each home has individual wifi the passwords are the same allowing us to work remotely from the house or the poolside. Margarita lives onsite as the caretaker; a job she takes seriously as she was readily available to assist with all our questions/needs. The house itself was well laid out allowing for privacy between the bedrooms and more than enough room for a family of four. The compound is located within easy walking distance of the Main Street but far enough away from the nois of night time revellers. Great rental. Hi David and Evelyn! So glad you enjoyed your stay here at Pueblo Colonial and thank you for pointing out some of the features that make Pueblo Colonial a great rental. I hope you'll be able to come back and enjoy this special place again! Wonderful stay at Pueblo Colonial. Margaritha is fantastic and always available for questions and advice and directions. Walking distance to town and beach, pool in complex is lovely. 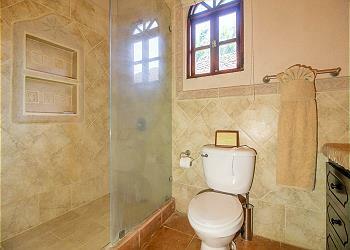 Very secure, house is perfect for couples or families with two spacious bedrooms and two bathrooms. My only recommendation is if you are driving ask Margaritha for directions or call her once you arrive in town - it can be difficult to find at first. Hi Theresa! 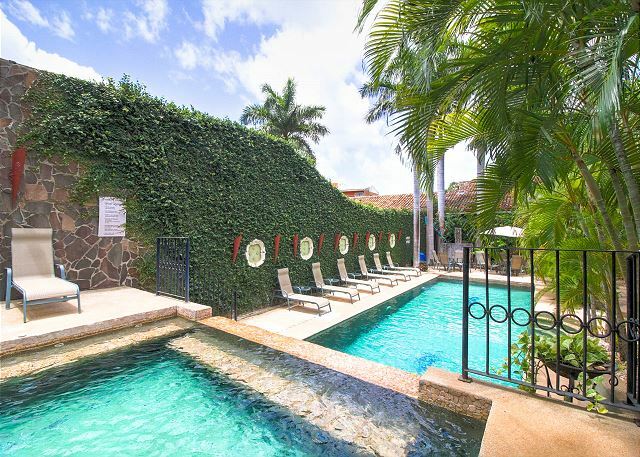 We do have the best pool in Tamarindo! It can definitely be challenging finding your way in a place with no street addresses so I do always recommend that people write down my number just in case they get turned around. Thank you for the kind words, and please come see us again! - Margaritha. Pueblo Colonial is nice, clean, great pool & landscaping. The only con was the walking down the road to get into town....which we later just started using the taxi services. Priced right!